No.10 seed Novak Djokovic returned from multiple rain delays from Thursday afternoon and night to win the third set of a comeback victory over fifth seed Grigor Dimitrov at the Western & Southern Open. 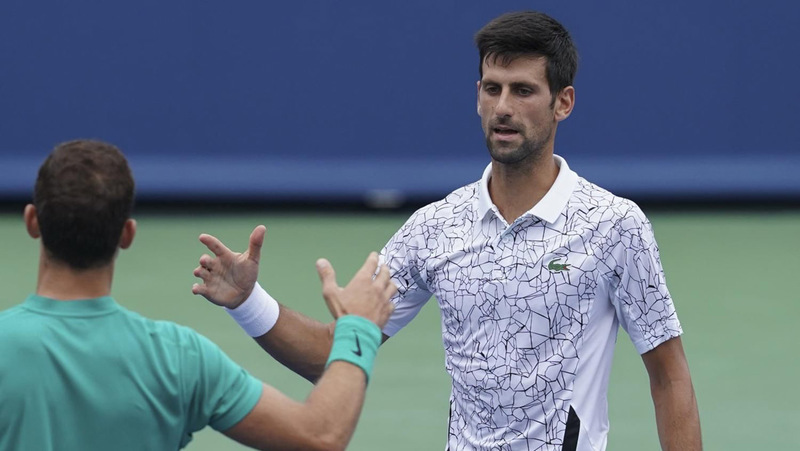 Novak won four of the final seven games of a two-day clash with the defending champion to advance, 2-6, 6-3, 6-4, in the third round of Cincinnati Masters. The five-time former finalist Djokovic led Grigor Dimitrov 2-6, 6-3, 2-1 on Thursday, when rained stopped play. It was cancelled for the day at 10:14 p.m. local time. Dimitrov started strong. He broke Novak twice in the opening set, in the third and seventh games, to gain advantage. The start of the second set followed a similar pattern to the first with Novak again being broken in the third game. However, this time the Serbian ace was able to mount a fightback, breaking his rival twice to level the contest and force a decider. After the second set, play was suspended due to heavy rain. Players were back on court an hour and a half later. Djokovic had made a break in the third game before rain once again interrupted play. Match resumed on Friday. The 31-year-old Belgrade native held serve throughout the remainder to keep the lead. He sealed his 30th win of the season after two hours and 19 minutes spent on court over two days. Match statistics: aces (4-10), double faults (1-3), winners (21-32), unforced errors (30-35), total points won (86-82). Novak will take on Milos Raonic in the quarter-final later tonight. He owns a perfect 8-0 H2H record against the Canadian. Djokovic is biding to complete a sweep of the ATP Masters 1000 tournaments. Should he win the Western & Southern Open for the first time, he would become the first singles player to win all of the ATP World Tour’s nine premier events.